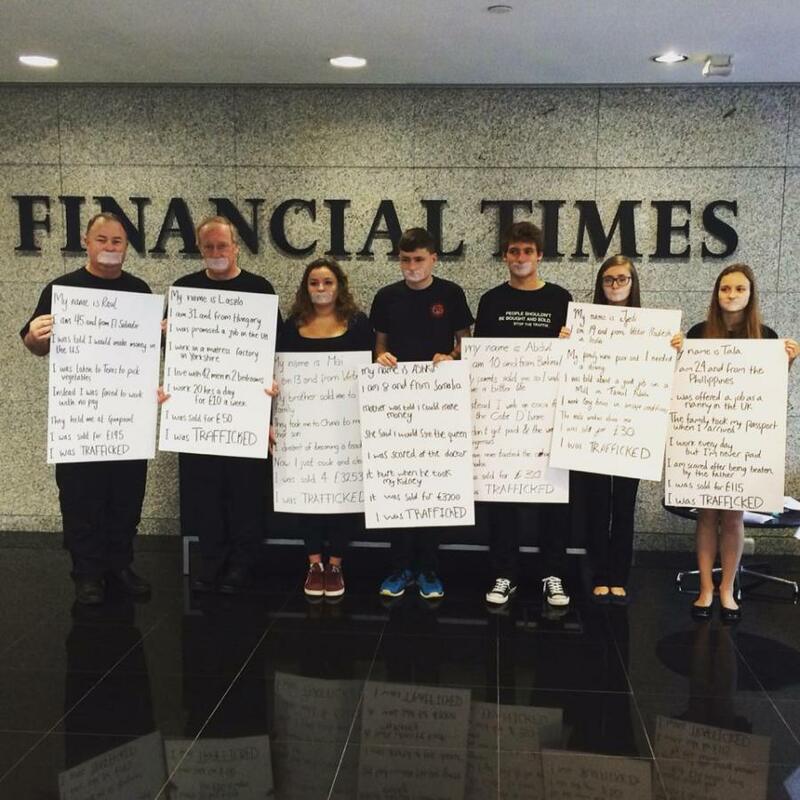 The Financial Times has chosen Stop the Traffik as its 2015-2016 charity seasonal appeal partner this year. To mark the launch of this Christmas appeal, a new report on human trafficking, Forced Labour, Human Trafficking and the FTSE 100, is being launched at a breakfast briefing this morning [20 November 2015] in the Financial Times Conference Centre in London. The invitation says people trafficking is one of the major rights issues of our time. Businesses, shareholders and investors now have responsibility to act to prevent this terrible crime. With the Modern Slavery Act 2015 now in force, directors of UK companies have an obligation to disclose how they are tackling this risk across their businesses and – crucially – within their supply chains. Stop the Traffik is a global charity working to prevent human trafficking and to disrupt its supply chains around the world, and the Financial Times is a powerful new partner with the clout to make a real difference in the battle against forced labour and trafficking around the world. This morning’s joint report on human trafficking and forced labour highlights the business risks arising from human trafficking and the impact of the Modern Slavery Act. The report has been developed in recent months in a partnership between Stop the Traffik and other agencies, including the Anglican mission agency, Us (previously USPG, the United Society for the Propagation of the Gospel). This ground-breaking research has been endorsed by Archbishop Justin Welby of Canterbury and is supported by Us (USPG), Stop the Traffik (STT), Finance Against Trafficking (FAT), the Ecumenical Council for Corporate Responsibility (ECCR), and Rathbone Greenbank. I am a Trustee of Us (USPG) which has helped to fund this academic research into the links between human trafficking and the global activities of FTSE 100 companies. The report also highlights best practice so that lives can be saved. The research is motivated by a concern that FTSE 100 companies may inadvertently become involved in human trafficking through links with suppliers around the world. The report provides essential guidance to investors and executive teams to help disrupt this global crime. She says the research digs deep into the phenomenon of human trafficking, taking as its focus the supply chains of the FTSE 100 companies, and exploring how human trafficking is a part of the picture. “We want to see FTSE 100 companies better informed to help them ensure there is as little risk as possible that their supply chain is somehow touched by the traffickers’ trade,” says Rachel. Financial Times appeals have raised over £16 million for charities over the last 10 years, including the International Rescue Committee, Action Against Hunger, Camfed, Room to Read, Sightsavers, The Global Fund for Children, Wateraid and World Child Cancer. The annual appeal runs from November to January, raising money and increasing awareness of the chosen charity through editorial coverage of its work. Seasonal appeal charities are selected by staff, and readers and corporate partners are encouraged to donate. One person is sold every 30 seconds, according to Finance Against Trafficking. Every year, 1.2 million children are trafficked across or within countries, according to UNICEF. And up to 800,000 people – mostly women and girls – are trafficked across international borders, according to the report Trafficking in Persons published in 2007 by the US State Department. This morning’s report has a further focus on an advocacy resource raising awareness of human trafficking aimed at churches and church-based organisations, so that they are better informed to join the campaign against human trafficking, both as shareholders and responsible community members. The Ecumenical Council for Corporate Responsibility (ECCR) is a church-based investor coalition and membership organisation. It was established over 25 years ago and raises awareness on business issues related to human rights, economic justice and environmental stewardship. Finance Against Trafficking works to raise awareness, equip and resource companies to help them effectively address all areas of their business that can be affected by people trafficking and manage the risk and threats to their businesses, supply chains and reputation. Rathbone Greenbank Investments (RGI) provides personalised and professional investment management services for investors who want to ensure their investments reflect their environmental, social and ethical concerns.